Revelation was written by John on Patmos - the result of a vision around 95 A.D. It is, indeed, the last book written. According to the tradition of the early church writer, Eusebius, John was on the island as a result of being exiled there by the Roman emperor. All we know about it from the scripture is found in verse 9, "I John, who also am your brother, and companion in tribulation, and in the kingdom and patience of Jesus Christ, was in the isle that is called Patmos, for the word of God, and for the testimony of Jesus Christ." There wasn't much to do on the island except commune with God. It's in this setting that John receives the words of the Book of Revelation. John introduces in verses 1-3 the purpose for writing down this prophecy. He then names his initial audience, the seven churches in Asia, a Roman province embracing the greater part of western Asia Minor. Today these locations are found in modern-day Turkey. Patmos, the island from which John is writing, is off the coast. The order of the churches is always listed the same. Notice the map provided here and observe that the order of listing is clockwise from the nearest one to Patmos (Ephesus), around, and back down towards Patmos. The testimony that John is recording is that of Jesus Christ (verse 2). John records what he saw from the angel of verse 2. Here's a rephrase of verse 3 that captures the essence of the Greek usage of the three present active participles used in that verse, "Blessed are the ones reading and the ones hearing the words of the prophecy and the ones guarding [in] the same having been written. For the time is near." John tells us, as Believers, how we are to regard the Book of Revelation: Read, hear and guard its words. Jesus is "the faithful witness." Greek "pistos" means faithful, trustworthy, reliable. Jesus is "the first begotten of the dead." In Colossians 1:15 (see notes) Paul says of Jesus, "Who is the image of the invisible God, the firstborn of every creature:"
In I Corinthians 15:23 (see notes) Paul said, "But every man in his own order: Christ the firstfruits; afterward they that are Christ’s at his coming." Paul describes Jesus in Romans 8:29 (see notes), "For whom he did foreknow, he also did predestinate to be conformed to the image of his Son, that he might be the firstborn among many brethren." Jesus' resurrection from the dead establishes the precedent for all Believers to follow. This concept, while used by Paul in his epistles, originates from Psalm 89 (see notes). Psalm 89:27 says, "Also I will make him my firstborn, higher than the kings of the earth." Jesus is "the prince of the kings of the earth." The Greek word for "prince" there is "archon" meaning "ruler." This is obviously another reference to Psalm 89:27. Jesus "washed us from our sins in his own blood." This is our spiritual rebirth. Let's not miss the declaration in verse 6 of the position before God of all Believers, "And hath made us kings and priests unto God and his Father..." We also see this doctrine of the priesthood of Believers in I Peter 2:9 (see notes), "But ye are a chosen generation, a royal priesthood, an holy nation, a peculiar people..." This being the case, those in Revelation 20:6 (see notes) who "shall reign with him a thousand years" certainly must be a reference to all Believers. Verse 7 is often misunderstood when it says, "Behold, he cometh with clouds; and every eye shall see him, and they also which pierced him: and all kindreds of the earth shall wail because of him. Even so, Amen." That's not the rapture of I Thessalonians 4:13-18 (see notes) and I Corinthians 15:51-58 (see notes); that's the second coming of Revelation 19:11-21 (see notes). Yes, I'm aware that Believers meet the Lord in the clouds in I Thessalonians 4:17, but all the criteria found in the verse are not met until the Battle of Armageddon. Click here to see the notes on Revelation 6 for additional clarifications. We see a three-point outline of the prophecy in verse 19, "Write the things which thou hast seen, and the things which are, and the things which shall be hereafter;" In addition to what John has seen in verse 1-18, he is told to write about "the things which are." This is a reference to the spiritual situation in the seven churches listed in Asia Minor in John's day. We'll see those situations in chapters 2-3. The future ("things which shall be hereafter") begins in Revelation 4 (see notes) and continues on to the end of the book. The "seven stars" and "seven candlesticks" are identified in verse 20 - "The seven stars are the angels of the seven churches: and the seven candlesticks which thou sawest are the seven churches." References will be made to these identifiers in chapters 2-3. The Greek word for "angel" ("aggelos") is also frequently translated "messenger." There is no prophecy in Revelation 2-3. John's vision contains instructions for these seven churches in Asia Minor. These were real churches in that day. Some have taken these seven churches to be church-age prophecy, with each of the seven churches mentioned representing a period of time beginning in the first century all the way down to our current day. In this extra-scriptural systematic assignment of Asia Minor churches to periods of church history, we are considered to be living in the Laodicean church age now in the 21st century. Here's the problem though; there's nothing in this passage or any other to suggest that these church exhortations are to be taken as anything more than exhortations to those actual seven churches in Asia Minor. So, I am convinced that our lesson here is to look at the attributes of these churches and identify the ones God does and does not honor...and to heed them. Remember, these are churches - local assemblies being referenced here. I do not see any basis whatsoever to identify these two chapters as an analogous message outlining the characteristics of seven ages of church history. Paul had previously visited there on his second missionary journey in Acts 18:19-21 (see notes), then again on his third missionary journey (Acts 19:8-10; 20:31, see notes), when he remained there for two years preaching in the synagogue (Acts 19:8,10), in the school of Tyrannus (Acts 19:9) and in private houses (Acts 20:20). Diana's temple was there, making it a pagan religious center for all of Asia. The Ephesians are commended for their patience, perseverance and intolerance for false teachers. Their problem is having left their first love. It would appear that they had lost site of their purpose and love for Christ and were merely going through the actions - proper actions, but with improper motivation. The removal of a lampstand in these two chapters is symbolic of a church becoming dead. It has no reference whatsoever to the salvation of individual believers. Here's John's admonition to them in verse 5: Remember what the old days were like and return to them. Repent (Greek: metanoeo) means to change one's mind or attitude. The Ephesians needed an attitude adjustment. Several theories have been offered regarding who the Nicolaitans were; many scholars believe that they were a gnostic group (see Gnosticism) originally founded by a man named Nicolaus, but we really have no direct evidence to validate such. It is assumed that they were a sect who preached false doctrine. Whoever they are, let's stay clear of them. Verse 7 is interesting. Let's define to whom "him that overcometh" refers. John wrote in I John 5:4-5 (see notes), "For whatsoever is born of God overcometh the world: and this is the victory that overcometh the world, even our faith. Who is he that overcometh the world, but he that believeth that Jesus is the Son of God?" So, John uses this phrase to describe Believers. The "tree of life" is a reference, first of all, to the one that was located in the Garden of Eden (Genesis 2:9, see notes). After Adam's sin, God drove them out of the Garden of Eden because, according to Genesis 3:22 (see notes), "...lest he put forth his hand, and take also of the tree of life, and eat, and live for ever." The fruit of that tree of life was apparently the means whereby God had granted them eternal life. We see in Revelation 22 (see notes) that, after the creation of the New Earth, there will once again exist the "tree of life." Revelation 22:2 says that it will exist there "for the healing of the nations." Therefore, access to the "tree of life" guarantees eternal life. Smyrna was a modern city with wide paved roads along with Roman and pagan temples. It was a center for medicine and science. The church there was probably founded while Paul was in and around Ephesus for approximately 2 years around 57 A.D. while on his third missionary journey (Acts 19:8-10; 20:31, see notes). Smyrna was close to Ephesus. There is no direct mention of them in Paul's third missionary journey, but he would have passed through on his way north. There are only two churches in this list of seven about which nothing critical is said. This is the first. Commendations for their works and suffering can be inferred here in verse 9. Apparently there were people in Smyrna presenting themselves as Jewish converts to Christianity, but were doing so falsely. No additional information is available. In verse 10, the "devil" (Greek: diabolos) means slanderer, but when used with the definite article (as here) usually means Satan himself. The "tribulation ten days" is a mystery...maybe a figure of speech. We see that death as a martyr brings a "crown of life." Tough times are ahead for these people, but they are commended for their faithfulness. Overcomers are defined by John as Believers in his first epistle (see note above). The "second death" is described by John in Revelation 20:14 (see notes), "And death and hell were cast into the lake of fire. This is the second death." Pergamos was about 15 miles inland and hosted three temples dedicated to Roman Emperors where they were worshipped as gods - one to Augustus Caesar. Pergamos was a religious center for that region. The "Imperial Cult" was a test of loyalty to Rome. Jews had integrated into Roman society there. Well, these folks had been faithful to the name of Christ, but that's about it on the good side. "Satan's seat" might be a reference to the three temples built to the Roman emperors located there. Despite being a religious center, they remained firm for Christ and became marked as not loyal to Rome. An unknown martyr, Antipas, was slain there. Verse 14 resurrects some Old Testament memories. You will recall that Balaam devised a plan whereby the daughters of the Moabites would seduce the Israelite men and lead them to sacrifice to their god Baal-peor in Numbers 25. You may also want to take a look at II Peter 2:15-16 (see notes) and Jude 11 (see notes) which also refer back to Numbers 25. (Click here to learn more regarding the events of Numbers 22-25.) It would appear that there were those in the church there who tempted the Believers with sinful practices in the same fashion as did Balaam. The Nicolaitans again get dishonorable mention here as they did regarding Ephesus (see above). There seemed to be a good bit of deviant doctrine inside the church. They must repent. In verse 16, repent (Greek: metanoeo) means to change one's mind or attitude. In verse 17, the manna is a reference to the Old Testament wilderness wandering (Exodus 16, see notes). The "white stone" is a mystery. Thyatira was a city of craftsmen and merchants. Lydia, a convert of Paul in Acts 16:11-15 (see notes), was a seller of purple fabric there. We are told from secular sources that many trade guilds operated in Thyatira. The city hosted a major cult of Apollo, son of Zeus - the deity associated with prophecy and the sun. These folks are commended in verse 19 for their "works, and charity, and service, and faith, and thy patience." However, they had a problem...big problem. Jezebel may not have been her actual name. It could have been the tag given her by Christ in this passage because of her dastardly deeds. My rule of thumb has always been this: Being called Jezebel is never a compliment. She had obviously corrupted this church with false teaching accompanied apparently with a teaching of cultic immorality (verses 21-24). In addition to the words of this passage, that notion is based upon the showdown between Elijah, Jezebel and her band of heathen prophets of Baal. It's a great read in I Kings 18-19 when you have time. This church gets a one-sentence commendation in verse 19, but it's all downhill from there. If they don't repent, severe judgment is on the way. There is a reference to ruling in verse 26. Apparently saints will rule over the nations with Christ. Faithfulness here is rewarded with responsibility during the millennium over Gentile nations. We don't have any additional details regarding the "morning star" of verse 28. Here's what we know about Sardis from history. It was a very old city, well fortified on top of a mountain. It had been conquered by the Persians in the 6th century B.C. and Greeks in the 3rd century B.C. This modern city maintained a temple to the Greek goddess Artemis. Sardis also had a well-established Jewish population. Of all the seven churches, this one receives the most criticism. Have you ever been to a church and said, "This church is dead!"? Well, that's the description of Sardis. The message to this congregation is, "Wake up!" There were a few in the church who were still perky as we see in verse 4. Let the revival form around them! "Repent" (Greek: metanoeo) means to change one's mind or attitude. Incidentally, verse 5 has been abused by those who teach that salvation is temporary - only effective as long as one is actively serving God. They abuse this verse with very poor deductive reasoning in assuming that the inverse is true - that if one does not overcome his name will be blotted out of the book of life. Ironically, verse 5 actually provides a very strong case for the security of the Believer and is not intended as a threat at all. Those referenced overcame to salvation, shall be clothed in white raiment and, thus, are eternally secure. That's the exact context in which John uses the term in I John 5:4-5 (see notes), "For whatsoever is born of God overcometh the world: and this is the victory that overcometh the world, even our faith. Who is he that overcometh the world, but he that believeth that Jesus is the Son of God?" So, John uses this phrase to describe Believers. Philadelphia was located about 90 miles inland on the Hermus River, a river that connected to the Mediterranean. It was often referred to as “Little Athens” because of the magnificent buildings and pagan temples located there. The city had a significant population of Jews who maintained a synagogue there. Only this church and Smyrna have no indictments against them. Apparently they were being attacked by those impostors mentioned in verse 9. The Philadelphians are told, "Just hang on; your day is coming!" There's an interesting reference in verse 7 regarding the opening and closing. Jesus is the "holy and true" one here. Here's a quote from Isaiah 22:22 (see notes), "And the key of the house of David will I lay upon his shoulder; so he shall open, and none shall shut; and he shall shut, and none shall open." In Hezekiah's reign, Shebna was replaced by Eliakim because Shebna's interests were not loyal to the security of Jerusalem against the Assyrians. Shebna was NOT holy and true. Though spiritually beaten down, the folks in Philadelphia remained faithful and true. According to John's definition (I John 5:4-5, see notes), overcomers are Believers (see note above for more details). 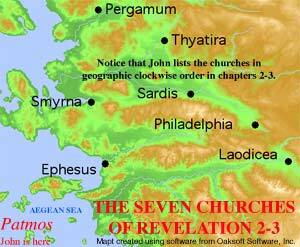 All of the details regarding the New Jerusalem are found in Revelation 21-22 (see notes). The Laodiceans - there is not a single positive comment about these folks here. There's kind of an interesting play on words concerning these Laodiceans. They piped their water through enclosed conduits for several miles to the city. As a result, their water was lukewarm. These people understood, "lukewarm." Thus, their works are compared to lukewarm water - not that good; not that bad - just lukewarm. Is God happy with a lukewarm church? Obviously not (verse 16)! However, they thought they were okay according to verse 17, but not so according to verse 18. An interesting linkage is made in that verse regarding the trade resources of the city of Laodicea. It was a banking center, whose banks even Cicero recommended for exchanging money; it manufactured clothing and wool carpets, made from the glossy black wool of sheep raised locally; it also had a medical school and produced a popular eye ointment made from a pulverized rock found in the area. Now look at verse 18 in that context, "I counsel thee to buy of me gold tried in the fire, that thou mayest be rich; and white raiment, that thou mayest be clothed, and that the shame of thy nakedness do not appear; and anoint thine eyes with eyesalve, that thou mayest see." Interesting stuff, huh? The "Amen" (verse 14) is a transliteration of the Greek meaning “trustworthy.” We also see the eternal presence of Jesus emphasized, just as it was by John in John 1:1,14 (see notes). Notice the reference to chastisement in verse 19. Why? Because he loves them. That would indicate that these "neither cold nor hot" folks were Believers. God chastens Believers according to Hebrews 12:6-8 (see notes), "For whom the Lord loveth he chasteneth, and scourgeth every son whom he receiveth. If ye endure chastening, God dealeth with you as with sons; for what son is he whom the father chasteneth not? But if ye be without chastisement, whereof all are partakers, then are ye bastards, and not sons." That phrase, "as many as I love," establishes that these are "lukewarm" Believers being addressed here and encouraged to "repent" (Greek: metanoeo i.e. change one's mind or attitude). An appeal is made in verse 20 for the local assembly to invite Christ back in. Works done in a church by the empowerment of the Holy Spirit are not lukewarm; they are HOT! Let's look closely at Revelation 3:20, "Behold, I stand at the door, and knock: if any man hear my voice, and open the door, I will come in to him, and will sup with him, and he with me." Some use this verse as a call to personal salvation. For personal salvation, the knocking-on-the-door metaphor just makes a nice presentation when presenting the Gospel message. Incidentally, the "any man" (KJV) reference there is simply a translation of the Greek word "tis" which is not gender specific; it means "a certain one." This verse, though technically directed to individual Laodiceans to once again establish fellowship with Christ, does make a rather nice salvation invitation. However, that does do a bit of injustice to the context here. According to John's definition (I John 5:4-5, see notes), overcomers (verse 21) are Believers (see note above for more details). After the rapture of the church indicated in I Thessalonians 4:13-18 (see notes) and I Corinthians 15:51-58 (see notes), we are told in I Thessalonians 4:17, "...and so shall we ever be with the Lord." Of course, we'll be ruling with Christ.